Patrick McEnroe explains why Serena Williams 2014 US Open title firmly cements her place as the greatest women's tennis player of all time. NEW YORK -- It seemed to wash over Serena Williams in waves after that first knocked-down-by-a-feather moment Sunday, when she was flat on her back on the Arthur Ashe Stadium court. There were tears with opponent Caroline Wozniacki's congratulatory hug following the 6-3, 6-3 victory and then a look of surprise at Chris Evert and Martina Navratilova's appearance to welcome Williams into their select sorority with a Tiffany bracelet with an engraved 18 dangling as its solitary charm. Serena Williams won her 18th major at the same place she won her first 15 years ago. There was a wide grin with the acceptance of Williams' sixth and third straight US Open trophy. This was the first time any woman has won three straight since Evert won four from 1975 to 1978. Then, as the stadium emptied and Evert and Navratilova left, the woman who now seems destined to cement her legacy by going after Steffi Graf's 22 Grand Slam titles and perhaps even Margaret Court's record 24 appeared to finally relax. Suddenly jumping up and down with the trophy still in hand, Williams was childlike, joyous, the pressure seemingly leaving her with each happy hop. She spoke of being tight and nervous throughout the match, though it hardly showed after the first set. But there could be few who watched Williams this year and did not feel the weight bearing down on her. "Getting to No. 18 has been on my shoulders for so long," she said within minutes of match point. It was easy to overlook the very human emotions in a player so gifted with otherworldly abilities. It was easier to ascribe three straight Grand Slams in which she would fail to get past the fourth round -- her worst start to a year in which she played the Australian, French and Wimbledon since her first year as a pro in 1998 -- as the beginning of the end. In retrospect, it is laughable. So long it has been on her shoulders? The woman won the US Open last year for her 17th major title. This was the same 2013 in which she also became the first player since Martina Hingis in 1997 to win 11 tournaments or more in a single year. It was the same year she became the oldest woman to win the WTA Championships, and she was named the Associated Press Female Athlete of the Year as well as Best Female Athlete at The ESPYS. Infographic: They all have 18 majors. A look at some other key numbers in the careers of Serena Williams, Chris Evert and Martina Navratilova. Analysis: Is Serena Williams the best ever? 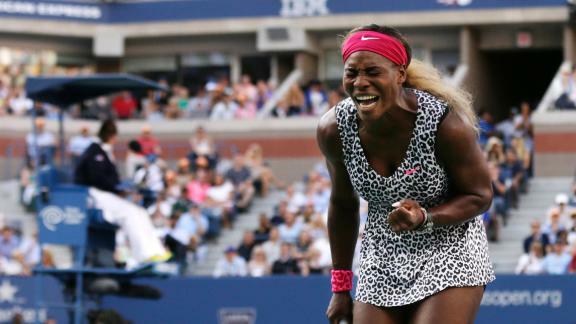 Slideshow: Rewind all 18 of Serena Williams' majors. Applause in the Action: One woman sold her house to come, and one couple has been here since the '70s. Meet the fans of the US Open. A hair-raising Open: We combed through the action and found these winning 'dos. Yet in 2014, she looked vulnerable, oddly lacking in confidence, unfocused. At 32, we wondered if Williams was getting old. And then at 19 days short of 33, she looked once again like nothing could stop her. "I definitely think when Serena is on her game, there's not much we can do," said Wozniacki, who indeed did very little to challenge Serena. Wozniacki achieved her first winner in the ninth game of the second set and only four in all, to Williams' 29. The idea that talent alone was responsible had Williams' opponent and good friend defending her. "I don't believe talent can beat everything," Wozniacki said. "She works hard every day just like us. But when she needs to, she can pull out that big serve. She has the power. She can push us back on the court and take the initiative. She definitely has the experience now as well. ... Now she knows what she needs to do out there, and it makes it even harder to beat her." It has been a record 15 years between her first and most recent US Open victory for Williams, but it was only the fifth time she has won a Grand Slam title -- the third here -- without dropping a set. Winning No. 18 and winning it here where she won her first, where she dreamed of winning one day, mean everything to her, she said. "I just could never have imagined I would be mentioned with Chris Evert or with Martina Navratilova because I was just a kid with a dream and a racket living in Compton," she said. Caroline Wozniacki's serve was just about the only thing that did any damage against Serena Williams on Sunday. When Wozniacki invokes the "we" and "us" in speaking of trying to beat Williams, it only reinforces her level of greatness. It is, in fact, Serena against the world. It shows in her killer instinct and a record of 75-1 when she wins the first set here and a staggering 226-5 in all Grand Slams. It shows in her attitude now. At the same time as she is salvaging a season, she is clearly invigorated as well. Asked to put No. 18 and her own legacy in context, she looks instead to the future. "I don't think about it so much because I'm still playing," she said. "I'm already looking at maybe No. 19. ... I think once you [start thinking about it], you become a little satisfied. "I don't want to become that. I want to continue to rise and continue to play really hard and do the best I can." It's bad news for the rest of women's tennis and great news for Williams' fans. So is her answer to the question of how she feels about being considered the greatest of all time. "I've heard it, obviously, but I don't think about it," she said. "I'm just a simple individual who just wants to win titles and wants to play tennis. I want to do really well, and I love the game. "The reason I play is to sit at the end of the day and hold the trophy or stand and hold the trophy. For me, that's my joy."